Atlantis Adventure is not just a classic match 3 puzzle, it also includes an interesting plot, wonderful locations, and cool effects! 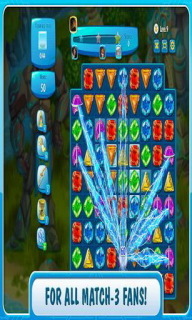 Travel through Atlantis, solve puzzles, complete levels and just have a great time! * More than 30 different locations and over 500 interesting levels - you won&rsquo;t have time to miss! * 9 sorts of boosters and 7 sorts of amulets that make the game easier and more comfortable. * 6 types of puzzles that fit every taste. * Compete with friends by synchronizing your game progress with Facebook. Def Jam - Fight for N..